Sometimes a novel comes along that is a reflection of the times we live in today, with little to indicate to the reader that it is actually a thriller. Locke’s extraordinary Bluebird, Bluebird follows Ian Fleming’s definition of a thriller, being a novel that ‘you simply have to turn the page’, but it also contains writing that forces the reader to think deeply - while the pages turn. At the centre of this thriller we have a black cop, Darren Matthews, a Texas Ranger battling his demons both in his marriage and at the bottom of the bottle. While on suspension due to irregularities in a case of a murdered member of the racist group, the ABT [Aryan Brotherhood of Texas] - he takes Highway 59 to the small East Texas town of Lark. In Lark, Matthews finds himself embroiled in a case where the bodies of a Chicago lawyer, Michael Wright and a local waitress Missy Dale, are found lifeless in a bayou. The issue is that Wright is black and Dale is white – a throwback to a racially volatile past. Coupled to a vividly realised sense of place, the bodies in the bayou act as a marker that perhaps little has changed in terms of racial justice between the America of today, and that of the dark past. Matthews comes to the aid of Wright’s widow, which puts him in the epicentre of not only a criminal investigation, but also examines the hate that simmers under a divided society – one never far from the meniscus. 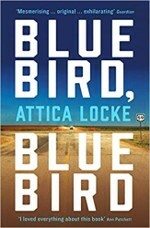 Locke uses the techniques of a thriller novel as social commentary, but takes care not to allow Bluebird Bluebird to become a diatribe against racism. What is uncovered is a bleak assessment of racial America, where little has really changed in terms of how the hatred of others, and the machinations of small-town America remain intertwined. We see poverty and the infiltration of illicit drugs impact the community. Though evocatively set in Texas, it captures the backdrop vividly, though the characters that populate the story could be from any number of poor small-towns that pepper rural America. Like Poitier’s performance in the film In the Heat of the Night, Darren Matthews’ presence in Lark is far from welcome, as he makes enemies investigating the dead bodies in the bayou. Ranks close and his presence is not welcomed. What Matthews uncovers is complex, for he sees that beneath the surface there are issues that have remained hidden. The pacing of the narrative is measured, allowing the reader’s thoughts to become unfettered as the ‘powers-that-be’ try to avoid a racial motive for the deaths under the sour waters of modern America; an America where little has changed since the civil rights movement and where the current President recalls the greatness of the past, with a red baseball cap and a soundbite. It sometimes takes fiction in the form of a thriller novel to expose the reality that others live, and indicates that the past is like a sleeping wolf, that occasionally wakes from slumber. Most importantly, Attica Locke’s Bluebird, Bluebird demands the reader the pages rapidly. As a novel it entertains just as much as it disturbs and thrills. Together with my fellow judges for the CWA Ian Fleming Steel Dagger, we were fortunate to read this remarkable novel as one of the submissions for 2018. Despite much debate over the excellent thrillers in competition; Bluebird, Bluebird became our choice for the best thriller of 2018. As a thriller novel, Bluebird, Bluebird made us all turn the pages with urgency. It is a novel with a disturbing and thought-provoking narrative; one that is as prescient today, just as it was in days now passed.